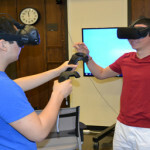 Two related technologies that are really starting to gain momentum and show the promise of fun, engaged learning experiences are Augmented and Virtual Reality. 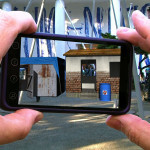 There are more exciting education-oriented Augmented Reality apps available for free on your smartphones and tablets every day (here's a few to check out). In the more immersive world of Virtual Reality, there is more of a price barrier to entry since you require a headset to use the available applications. I see here that the much anticipated Oculus Rift can be pre-ordered now for $599 … well, that's certainly not an option for many classrooms. Fortunately, Google came along last year with a low cost, entry-point cardboard headset priced from roughly $10 to $20 US, depending on where you buy it. I finally picked one up and tried it out this weekend. I got the Unofficial Google Cardboard device (just the “2.0” model). It's nicely made. I will say that each step of the way, as I had to figure out how to open it, insert my phone, find and try some apps, figure out what I'm supposed to be experiencing and looking for, etc., was more challenging than I expected. I also was experiencing a double-vision view when I looked through both lenses at once and it took me some time, and a Google search, to realize I had to position the iPhone 5 that I was using just right to get a good view. Once I had it all figured out and found a few apps I liked, I was sold on the basics. It's important to know that, so far a lot of the available apps feel more like glorified demos rather than truly interactive experiences, but a few of those I tried showed some great potential for this concept. This is the easiest part – go right to Google's page where they list offerings from many vendors, and select one and buy it! As you'll see, they run mostly from $10 to $20. This wasn't super obvious to me, as easy as it ultimately was, and there was no little instructional doc of any sort. With Unofficial Cardboard, I had to flip out, fold, and bend in a piece of cardboard that become the face-touching part of the viewer as you look through it. Now you will want to go to either Google Play or the App Store and search out and install the Google Cardboard app. After install, it may prompt you to scan a QR code on your cardboard device (mine asked this, but somehow it moved on before I could scan it, and then I couldn't get back there … later, one of the apps asked me to scan the QR code again and this time it worked, but I have no idea what this really accomplished). Slide your phone in and close the cardboard flap. Be sure to try and center the phone so that your view is the best it can be. The iOS app has some simple demos in it (which were not impressive). 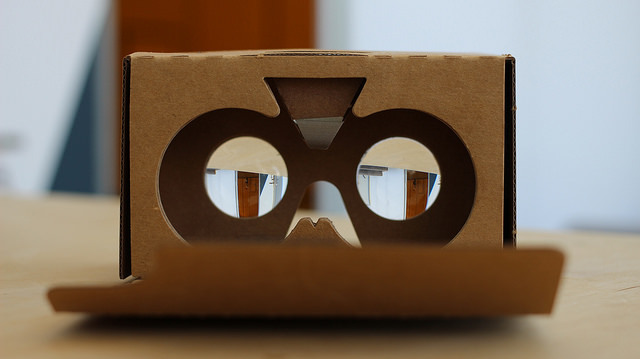 There isn't a lot of interaction with Google Cardboard – basically some apps let you press the one ‘button' to select some menu option or action. Search out and Test out Some Apps! This is where it can start to get fun! Here (below) are a few of the cooler apps I tried so far (these are each from “Unimersiv“). I tried a few other apps but either was not impressed, or really just didn't understand what was supposed to happen in them. Molecule VR: This app introduces some basic concepts about cell communication and signalling, while you float around in a micro-cellular world. Aquarium: Get immersed under water with clowns, sharks, sea turtles and more. DinoLand VR: This was a cool visit to land populated by dinosaurs. There isn't a ton going on here, but to walk among the dinos and hear their screeches and roars for a little is pretty cool. I've searched out lists of best VR apps and best apps for education, but was challenged to find many apps that were straightforward to use and did something that seemed to make sense. But based on the above apps, I can certainly see this being a pretty cool entry point to VR and it's potential for education. I look forward to learning and sharing more – if you are a fan of some of these VR apps, please comment and share your favorites! Translate Text on the Fly Using Your Phone and the Google Translate App. Brilliant!